I have been exploring many possibilities with branches this year mostly because we had so much tree damage from the October snowstorm. The supply is plentiful. I do love using branches to bring the outdoors in and have found many ideas in this area that excite me. I was especially taken by this example that crossed my pinning this week. 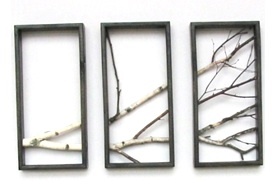 It is a triptych of frames highlighting a birch branch. It is created by John Oman and he has a variety of branch concepts for sale in his Etsy shop here. I first saw this one presented in a vertical orientation but when I explored further, I found it for sale on Shabby Apple and it is display in a horizontal orientation. I am not sure which I like best but I expect the final wall location can best dictate the direction. My branch series just keeps growing. If you like incorporating branches in your decor, both in and out of doors be sure to check my theme page on Branches and my Pinterest board as well. I keep adding to them. Update: The artist, John Oman just sent me an email saying the piece is meant to hang horizontally. Question answered! 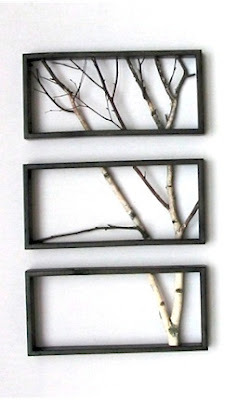 Visit his shop for some other creative birch tree possibilities.